The heart of the iQunet network is the iQunet server: a small size single board computer. The iQunet base station, acting as central network node from the sensor network, is directly connected via the USB port from the server. For network communication it has a standard 10/100 Ethernet port and is Wi-Fi enabled. It is powered via a standardized charger (included) or via a rail mount 5V power supply. 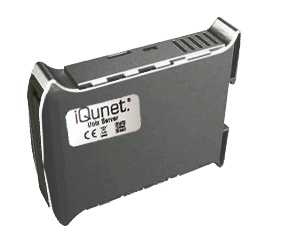 The iQunet server provides via internet access to the web based wireless sensor dashboard software which monitors the sensor network and drives the dynamic sensor parameterization. The iQunet server has an embedded OPC UA server inside guaranteeing seamless data exchange with SCADA systems or OPC historians where the data can be backed up. Sensor data collected with iQunet’s wireless, battery-operated sensors is “open source”. That makes the data readily available to your existing process monitoring and control systems via OPC unified architecture (UA) embedded in the iQunet server. iQunet strongly believes that data belongs to the customer. We do not impose any barriers or fees on your use of the data stored on the iQunet data server. iQunet offers straightforward pricing models for our products which includes the cost of software licenses.